Mr. Karunanidhi is the poster boy of the post independence politician in India and he can give a run for money (pun intended) to the likes of Sharad Pawar, Mulayam Singh Yadav and even Madam Sonia Gandhi. Those dark glasses not just hid his true intentions, they hid the nasty person inside the Tamil scholar. As you admire his extraordinary oratory skills in Tamil, also remember, he sat mutely as Jayalalitha’s sari was torn in the TN assembly by his colleagues. As you melt remembering his deep friendship with the great Sivaji Ganesan, also remember he is married thrice and has two wives who are alive … the joke is that he spends the morning with one and the evening with the other. So much for flouting the laws of the land and still becoming Chief Minister of a state FIVE times !!! 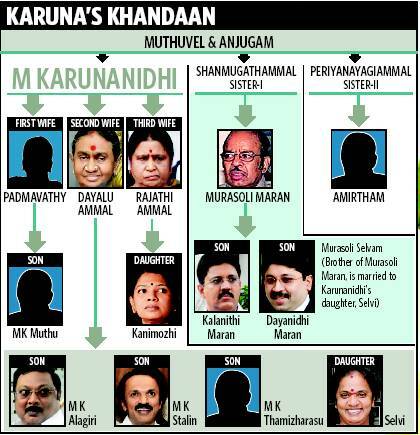 Most readers in India would recognise two more people in this extended family tree – Dayanidhi Maran (Aircel-Maxis scam, 2G scam and the telephone exchange in his own house) and Kalanithi Maran (of Sun TV fame … where all the money is pure white, hahahaha). Phew !! My head is reeling and imagine a single man managing all of this and leaving behind a fortune for each of them…. that is truly Mr. Karunanidhi’s legacy, Karuna-illa-Nidhi, compassion-less wealth. He is the ultimate family man – the wealth that he has generated from his political career surpasses many business houses and may never be fully accounted for. 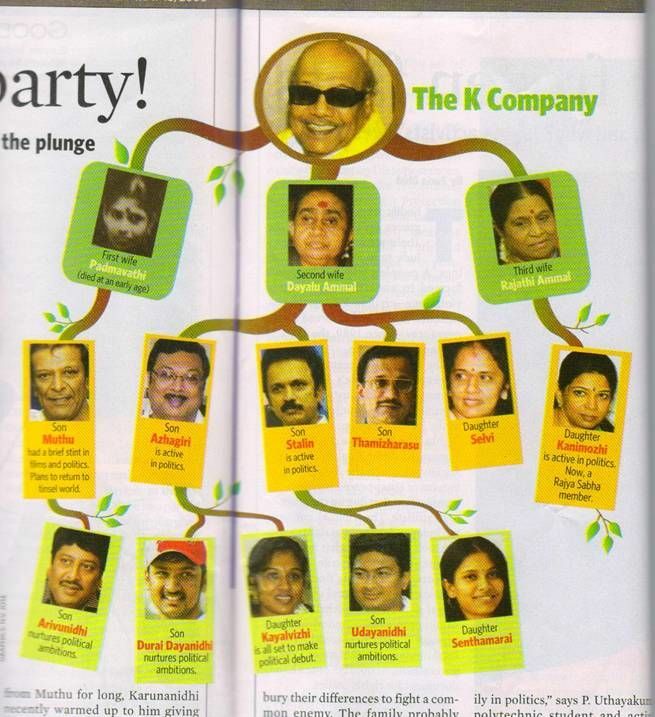 Do read this very interesting blog if you have any energy left – DMK Assets – 40000 Crores. I fell off my chair as any sane citizen of a supposedly poor country like ours would. India has poor people and then it has these UBER rich people, folks who have amassed an obscene amount of wealth. A few days back an old 2013 article surfaced saying Mrs. Sonia Gandhi is richer than the Queen of England… someone who has never owned any business except owning the CONgress party. See the parallel … Mr. Karunanidhi owns DMK, Mr. Mulayam Singh Yadav owns SP, Mr. Sharad Pawar probably owns Mumbai and a few adjoining villages besides NCP. I am hyperventilating already. Mr. Karunanidhi started his life as a script writer for Tamil films and entered politics at the age of 33. If he had continued his writing career he probably would be as celebrated as he is today… but his asset size would be a tiny fraction of what it is today. His diabolical inner self, the ability to survive in any situation and no holds barred corruption, all flowered in the political theatre. Even as you celebrate his administrative skills, remember they came at a fat packet being passed on unnoticed. Every single drop makes the ocean and it has … every single penny has helped construct this colossal wealth. When his time comes and he returns to the Earth and buffaloes graze at his memorial, remember that this man had the temerity to call one of the tallest leaders of our country Mr. Kamaraj, a “buffalo”. Remember, this man has a vile tongue and some of the epithets he has used for his political opponents will shame anyone – calling Mrs. Indira Gandhi’s injuries as blood from her periods, during her electoral campaign in Madurai :(:(. And when the soap opera of dividing his wealth unfolds remember that it is a morally bankrupt man’s assets that are being fought over by equally bankrupt folks. All that many people including me will miss is his oratory in Tamil. A sad end awaits an intellectually-gifted morally-bankrupt obscenely-rich man. Karunai-illa-Nidhi… Sorry Mr. Karunanidhi I have no compassion for you. Excellent Pre-obituary message to the shameless and Conscienceless family. I have no love lost for Jayalalitha But I admired her courage when she put him in jail literally lifting him away from his Gopalapuram abode and the way she handled the strike by the Tamilnadu Govt servants. Colonel you are so right… in Jayalalitha’s case, it was a waste of potential and as a woman, she faced a lot more hardship. She was used and abused – and she used and abused right back. While I don’t subscribe to her ways and don’t support her, I have always had a soft corner for her, probably because of her being a woman. She was just as corrupt and spoke harshly but was never crass like Karunanidhi. Please do read what Kannadasan has written about Kalaignar. Makes you feel terrible that he got elected as the Chief Minister five times :(.